An Action Packed Game That Proves That Mega Man Has More To Offer Even After 6 Classic Titles! The Mega Man series is one that needs no introduction and it’s a shame that the legacy has come to standstill in the past years with no end in sight, but that doesn’t mean we can’t enjoy the copious amounts of titles that have existed since the days of the NES. Up until 1994 the NES saw Mega Man 1-6 and while all good games, the series was losing steam due to the release of the SNES in 1991. Due to this Capcom decided to revitalize the series with a re-imagining of a new Mega Man. Mega Man X came out of the gate with everything that series fans had grown to love, but just bigger, better, and with everything we could have hoped for. 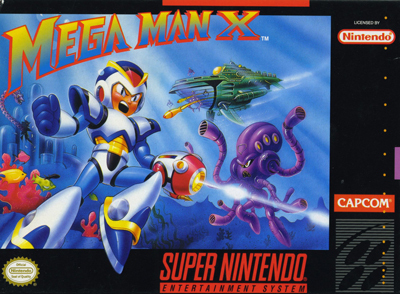 Starting with the controls Mega Man X just built upon the foundation of the originals with responsive movement and pixel perfect level and enemy design. X feels like an extension of yourself …the controls are that solid! As far as the actions that X can perform only two have really been added, but they change gameplay in ways you can’t imagine until you experience it for yourself. The first is a boosted jump. 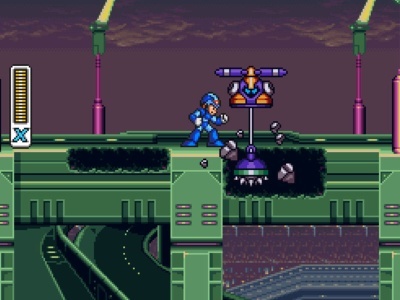 Early on in the game you will get an upgrade to your suit that will allow X to dash, much like Mega Man’s classic slide from the older games. This also allows you to hit the slide and jump button simultaneously for a longer jump. This allows for many more options during platforming and boss battles. On top of this you can also slide down and jump up or off walls. This adds an amazing new dimension to enemy encounters and the bosses have been given clever arsenals of attacks to promote use of these new functions. To add to the replayability and sense of character growth there are power-ups hidden in each level. These can range from heart tanks that permanently increase X’s health bar, energy tanks that can be charged and used to refill health during battle, and even different upgrades to X’s body armor. One in particular really adds a spice of depth to your weaponry and allows you to charge up not only your buster even further than before, but also your special weapons giving them great new effects and even completely different uses. It’s one of my favorite parts of the game and I really enjoyed replaying levels and experimenting with these options. 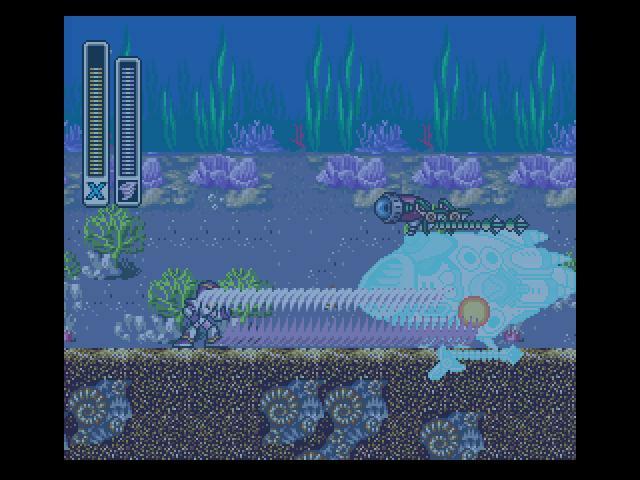 Level design in Mega Man X is nothing short of extraordinary. No two levels are similar and you will navigating levels via mine carts, flying platforms, conveyor belts, and water cyclones all while being assaulted from all sides by well crafted enemies that truly compliment the level layouts. Honestly I can’t think of a single point where the action lets up and I felt bored. Levels aren’t drug out and are short and to the point. 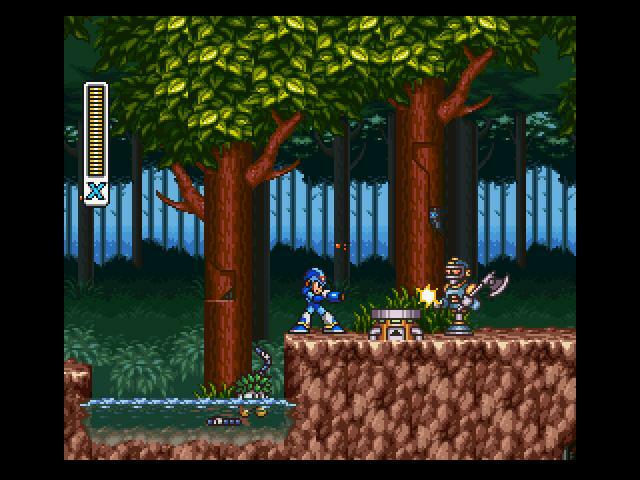 Levels should be fun and interesting to navigate and Mega Man X does not disappoint. I do have one complaint about this game and that’s with the last couple of levels after eliminating the 8 original Mavericks. These levels are not bad by any means, but they don’t have the same love and creativity put into them that is so apparent with the previous ones and they just use rehashes of previous enemies. It simply feels like the later levels were rushed. It’s a shame really as it’s the only blemish on what could be considered a perfect game. The character designs and attention to detail in each level really show off what the SNES was truly capable of and that’s lush, detailed pixel art. 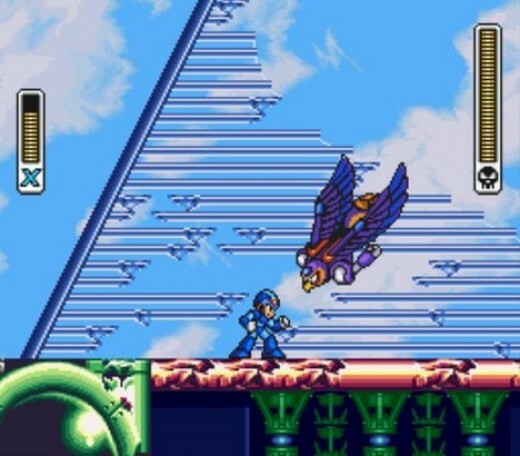 From the color palette, crisp animation, and sense of speed Mega Man X’s visuals will grab you and hold you till the end. One thing that I can’t credit Capcom enough for is the creativity in altering levels based upon your progress in the game. For example: if you finish Chill Penguin’s stage first before venturing to the Flame Mammoth stage the dangerous lava flow below each platform and conveyor belt is frozen over allowing for safe passage. Another great example is Spark Mandrills stage. After returning to this level after completing it and Storm Eagle’s stage the level will be much darker as if there has been a loss of power to the factory and at the beginning you can see the remnants of Storm Eagle’s airship strewn about. This detail really show just how much Capcom understood video games and what it took to make them great back in the 16-bit era. The opening theme to the intro stage is still one of the most iconic music tracks in gaming. Very few games can capture the excitement of how action packed and fun your journey is going to be 10 seconds into a level with such a well arranged, adrenaline pumping tune. While not all the songs live up to this same quality they are all very well done and set you in the mood to run and gun a few hundred robots. Each weapon, enemy, explosion and jump sounds perfect and feels awesome. 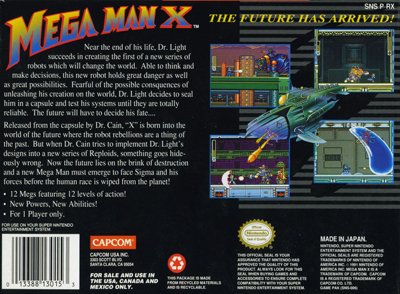 Mega Man X was one of the very first games I played for my SNES and it completely blew me away and the fact that it still can to this day really says something about it. It’s a classic in every sense of the word and every gamer and non-gamer alike should play it at least once and appreciate it for what it really is: a damn fun game!